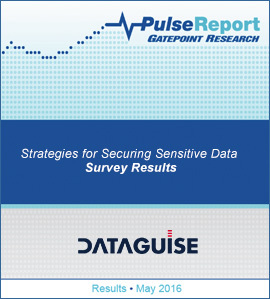 Dataguise can help you tackle the most comprehensive set of GPDR challenges with a single technology solution. 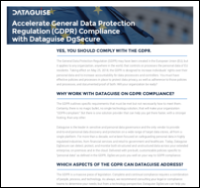 Download this datasheet and learn how DgSecure detects, protects, audits, and monitors personal data for GDPR compliance, on-premises and in the cloud. Teradata customers want to maximize the value of all their data. They want to give more users access to more data, but they also need to keep confidential information safe—and concerns about data security shouldn’t keep them from leveraging the power and efficiency of the cloud. The precursor to any comprehensive data-centric security and governance tool is knowing exactly what to protect. Dataguise DgSecure offers industry leading sensitive data detection capability that can accurately determine the counts and exact location of all the sensitive data in the enterprise data repository. 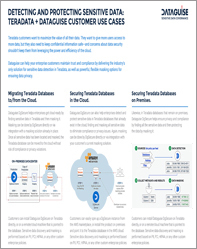 Sensitive data is constantly flowing in and out of your enterprise—and to and from the cloud—whether you know it or not. As big data gets bigger and cloud usage increases, governing sensitive data and managing digital risk at an enterprise level are daunting challenges. 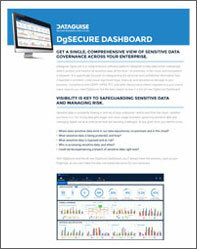 Learn how you can get a single, comprehensive view of sensitive data governance across your enterprise. 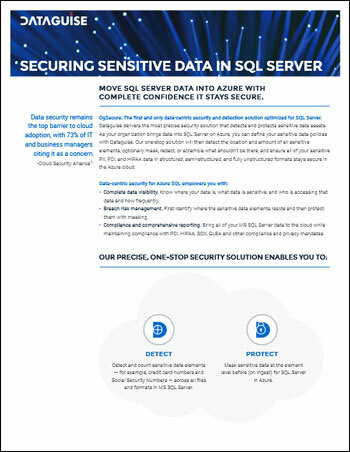 Dataguise DgSecure delivers the most precise, data-centric security solution that detects, audits, protects, and monitors sensitive data in real time wherever it lives and moves across the enterprise and in the cloud. 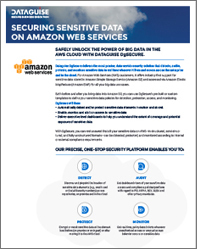 For Amazon Web Services (AWS) customers, it offers industry-first support for sensitive data stored in Amazon Simple Storage Service (Amazon S3) and accessed via Amazon Elastic MapReduce (Amazon EMR) for all your big data use cases. Don’t wait months before finding out you had a data breach. 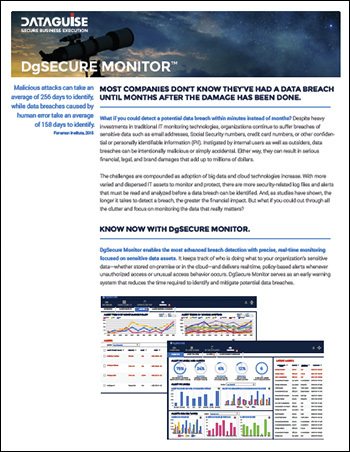 Know in just minutes with DgSecure Monitor, a different kind of monitoring solution precisely focused on safeguarding the sensitive data your organization values most. Download the datasheet to learn more. Secure Business Execution is the ability of an organization to safely and responsibly leverage all of their data to gain new business insights, drive incremental revenue and maximize competitive advantage. 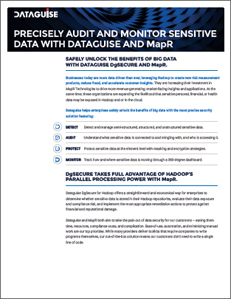 Learn how Dataguise enables this essential differentiator for today’s data-driven enterprise. 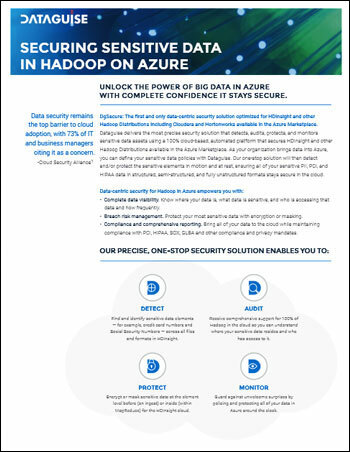 Dataguise delivers the most precise security solution that detects, audits, protects, and monitors sensitive data assets using a 100% cloud-based, automated platform that secures HDInsight and other Hadoop Distributions available in the Azure Marketplace. As your organization brings data into Azure, you can define your sensitive data policies with Dataguise. 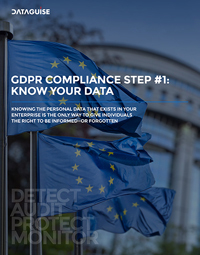 Stringent privacy laws, like the General Data Protection Regulation (GDPR) and the California Consumer Protection Act (CCPA), are creating new compliance challenges for enterprises. Before you can protect personal data, you need to identify it. That’s not so easy when your employees, customers, and data stores are spread across the globe, or even in the cloud. 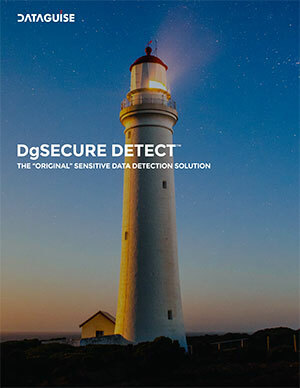 Learn why DgSecure Detect is the best discovery solution for helping data-driven enterprises mitigate the impact of a data breach or audit. 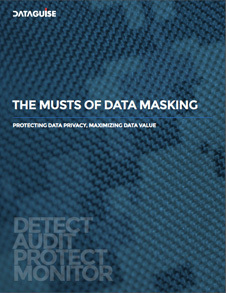 This white paper provides a good, solid overview of data masking. It covers when and why to mask data, the difference between masking and encryption, the various masking techniques, and best practices for masking to maximize the business value of the data. 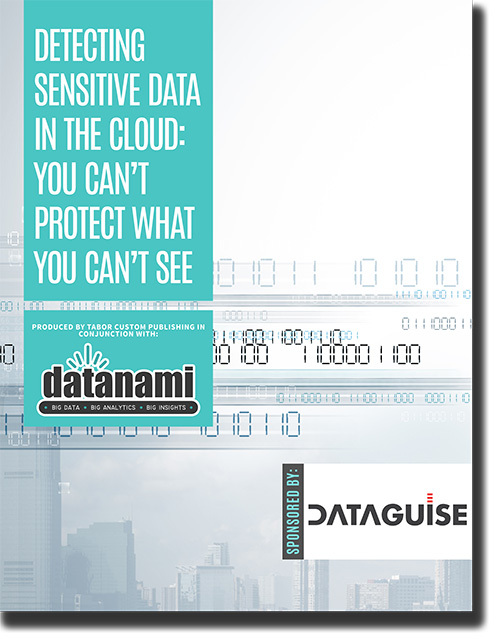 This report, produced in partnership with Datanami, highlights two major drawbacks of security tools on the market today and what’s needed to protect sensitive data in big data and cloud environments, including Hadoop. What are data-driven organizations doing to protect the privacy of confidential information—and is it too much, or not enough? Download the results of this recent CIO/CDO survey conducted by Gatepoint Research to see how you compare. 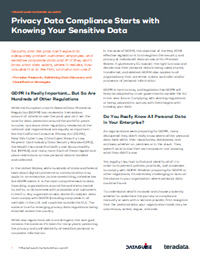 What is the bull’s-eye approach to data privacy protection for Hadoop? Organizations that need to make data-driven business decisions and also ensure compliance need a viable action plan to protect sensitive data with minimum business disruption. Download this white paper to learn about the 10 simple steps your organization can take to define an action plan that will enable you to securely unlock the power of big data in Hadoop. 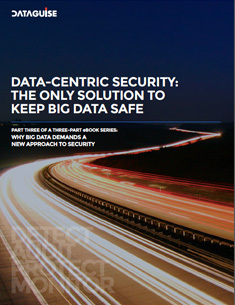 What are the challenges of protecting big data environments? Download this white paper to learn about Dataguise’s innovative software that can assess your organization’s data-related risks, protect the sensitive data you have, and allow you to safely reap the tremendous benefits of data in the Hadoop framework. Big data is taking companies by storm. Information is proliferating faster than organizations can manage it. Risks are heightening as enterprises share an ever-expanding trove of data with testers and data analysts. Download this white paper to learn how your organization can successfully detect and protect sensitive information in an increasingly challenging environment. Trōv, an on-demand insurance company, needed to pseudonymize structured and unstructured production data to help comply with GDPR and other data privacy regulations. It needed to be able to identify and protect all sensitive data, regardless of location. 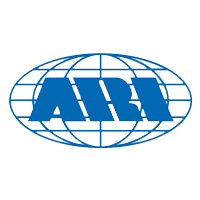 ARI Fleet, a global fleet management company, needed an affordable, and scalable, solution to mask data based upon specific business criteria. 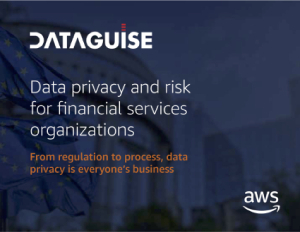 A financial services company needed to discover, protect, and monitor personally identifiable information (PII) stored across all its AWS data repositories to prepare for data protection laws that are country- and state-specific, including GDPR, CCPA, and PIPEDA. 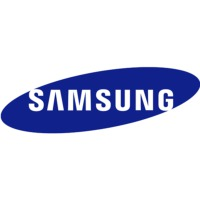 Samsung runs several of the world’s largest big data product analytics applications. To ensure worldwide global privacy protection, Samsung has deployed Dataguise across the globe to run continuous detection and encryption for the sensitive user-specific elements of their mobile phone logs. ﻿From regulation to process, data privacy is everyone’s business. Download this eBook and learn about data privacy considerations for all roles within your financial services organization. Knowing the personal data that exists in your enterprise is the only way to give individuals the right to be informed—or forgotten. 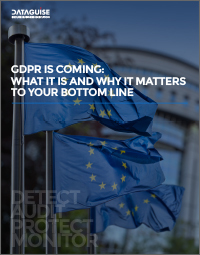 Download this eBook and learn how automated personal data discovery can put you on the faster path to meeting these and other key GDPR requirements. One of the biggest barriers for enterprises to migrate to the cloud has been the lack of a comprehensive and reliable security solution. Data cannot be forklifted to the cloud until all their sensitive data is secured through element-level encryption and/or masking. The countdown has begun. The General Data Protection Regulation (GDPR) is set to take effect in the spring of 2018, and with it comes many changes. Enterprises today have so much data and so many different requirements to use their data that there is a high variability in how data is collected, where it is stored, and how it is used. The ramifications of such variability is that enterprises cannot just forklift their entire data repository to the cloud, but instead require a much finer control on how and when they can do so. Cloud providers such as AWS take responsibility for securing their cloud infrastructure. They also give you tools and support to help you secure the data you put into the cloud. But is that enough to safeguard your most sensitive data? Even though big data and cloud computing have moved beyond the hype and into mainstream adoption, many companies hesitate to embark on cloud-based big data projects. 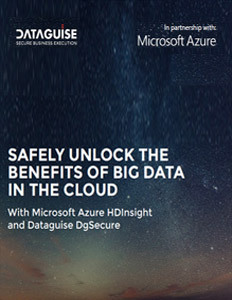 This eBook explains how Dataguise and Microsoft help address the biggest obstacles to unlocking the benefits of big data in the cloud. 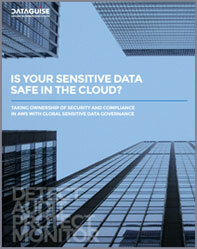 In this age of big data and the cloud, data security is no longer just an IT concern but a fundamental business issue. Boards of directors can be held responsible if organizations do not take adequate steps to reduce risk and protect confidential information. 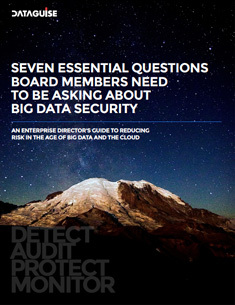 This eBook helps board members get a handle on their organization’s risk profile. Data in big data platforms like Hadoop is vast, varied, and vague, making it difficult to keep secure using traditional methods. This eBook explains why detecting and protecting data at the data (or element) level is the only way to keep confidential information safe as organizations consume and expand access to more and more data across the enterprise. 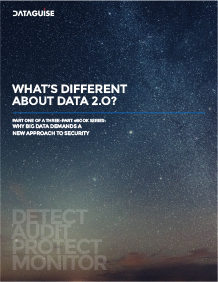 What’s Different About Data 2.0? Big data presents big opportunities, but it also creates big risks and big responsibilities that demand a new approach to data security. Learn four ways that data in Hadoop is different from data in traditional storage and management models, and why companies can no longer be certain that their data is secure.